The KONG Puzzlements are challenging dog puzzles with various sounds and levels. This toy consists of a figure surrounded by a ball. You can hide the legs of the figure in the ball to increase the difficulty. The Puzzlements are available in four characters: bee, monkey, beaver and hippo. 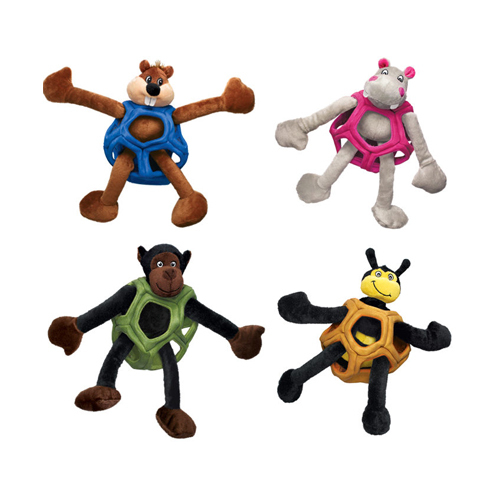 The KONG Puzzlements allow you to mentally challenge your dog. The toy consists of two parts: a figure and a ball with openings in which the figure is placed. Your dog has to try to get the figure out of the ball. You can place the legs of the Puzzlement in the ball to increase the difficulty. The toy also has a squeaker and crinkle sounds for extra fun. Have you used KONG Puzzlements before? Let us know what you think about this product.